Live by the sword, die by the sword. Team USA got into the lead in this event powered by good starts, but they got terrible ones in the final moto, and that made all the difference. Justin Barcia and Cooper Webb started outside the top ten, while the French duo of Gautier Paulin and Romain Febvre started further forward. Febvre, as he does, bulldozed to the front to take the lead from Ben Townley (!!!) who once again was riding like it was 2005. 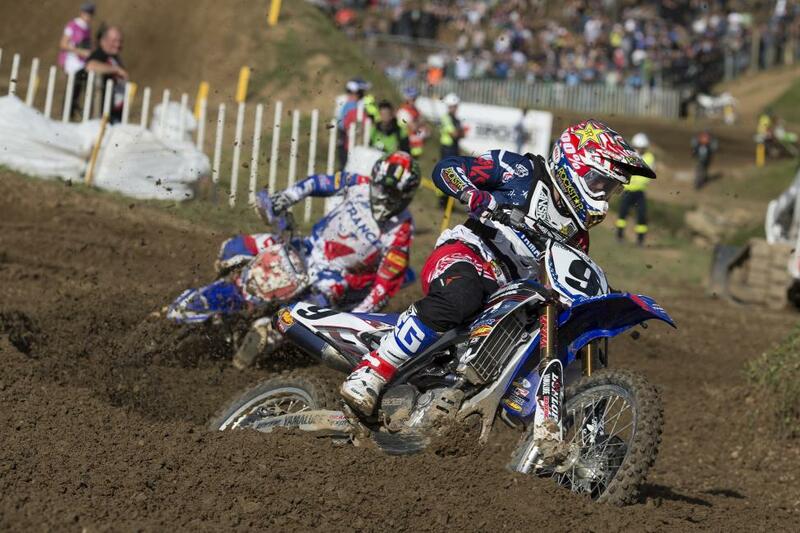 With Febvre in the lead, Paulin was the pivot point for the French team. Barcia and Webb would have to catch and pass him to have any hopes of making it happen--because no one was going to do anything with Febvre up front. Barcia and Webb got into the top ten and at one point started flying in formation, in 6th and 7th, and Barcia even let Webb pass him as they went after Paulin. Then Webb stalled. Barcia kept charging, Paulin passed Australia's Dean Ferris for 4th, then Ferris crashed. Barcia caught Paulin and made the pass, but the US was still down three points. Barcia put in a hell of a charge, and got Russia's Evgeny Bobyrshev for third, and Team USA was down two points. With two laps to go, Barcia would have to catch Townley for second, and Webb would have get Paulin. They ran out of time. 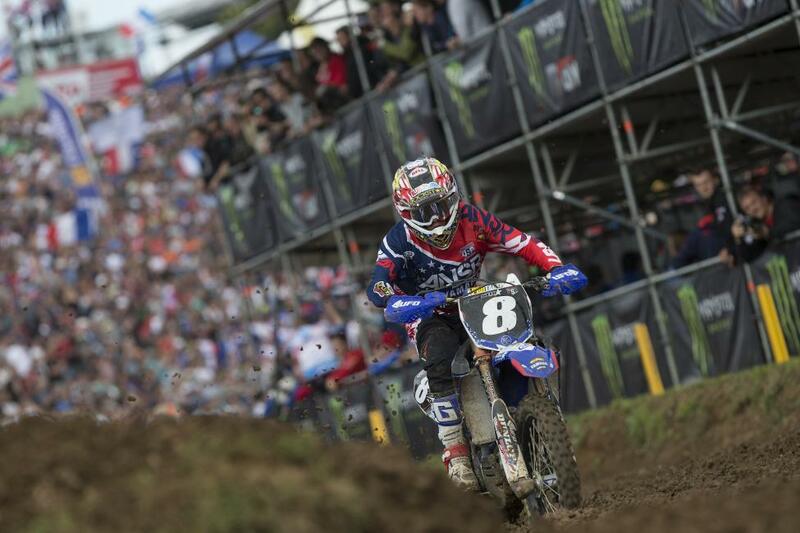 Febvre crossed the line for his second-straight moto win, and Paulin's fourth was enough for Team France to repeat as winners. The fans went nuts for the home team.For Febvre, a dream season is complete, with a dominant MXGP Championship run and now a perfect day leading his team to victory. The guy has simply been unreal this year. Team USA gave it a great effort, but came up short. In many years, 16 points would have been enough to win, but this French team was clearly something special. Unfortunately, in the aftermath, the team will lament the bad starts in the last moto, and Webb's stall. Also, Martin battled Musquin in both motos, but Marvin got the better of him each time. This was a rare year where two teams completed the day without a single bad moto, so it came down to the smaller stuff. In contrast, Belgium's day started bleak but they clawed back in the final moto with Jeremy Van Horebeek seventh and Ken de Dycker ninth to snag the final podium spot. The Yanks have their starts dialed, because Cooper Webb, um, yanked the holeshot in this one to match Justin Barcia's jump from moto 1. Even better for the Americans, Jeremy Martin got the elbows ahead of Marvin Musquin off the start, so things were looking good for Team USA. Ah, but the French would not give in that easily. The beast known as Romain Febvre kicked it into gear, first passing his Yamaha teammate Jeremy Van Horebeek (who rides for Belgium) to get into third. Then he stalked second-place Dean Wilson, who did a solid job defending his position. But once Febvre was around, he went Cooper Webb stalking, and the duo would have to battle again, just like they did all day at Glen Helen, and again yesterday in the qualifier. Meanwhile, Musquin recovered from his bad start and found his groove, getting up behind Martin while they battled the 450s. A huge fight broke out between Wilson, Van Horebeek, Martin and Musquin, and Marvin quite incredibly blitzed past all of them to move into third. Martin would also get Wilson, but he couldn't catch Van Horebeek. 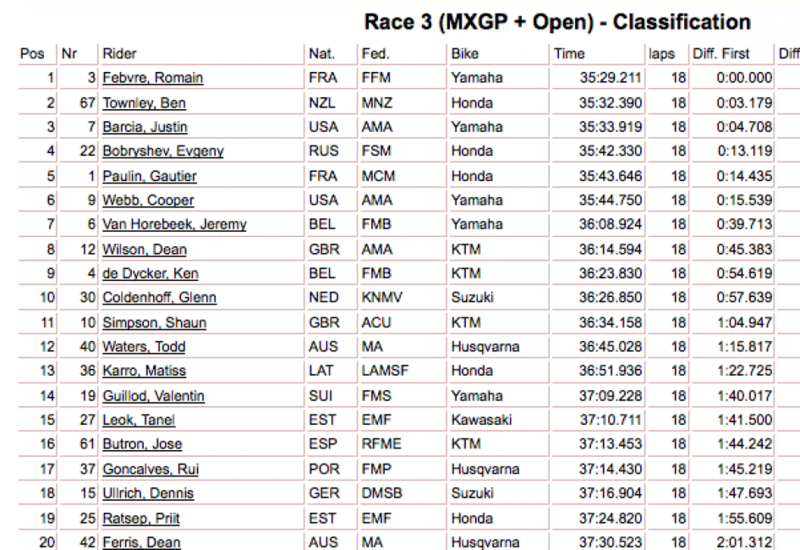 With that, Musquin would win the MX2 overall for the day and help France make up two points on Team USA. Up front, though, Webb was fighting back! 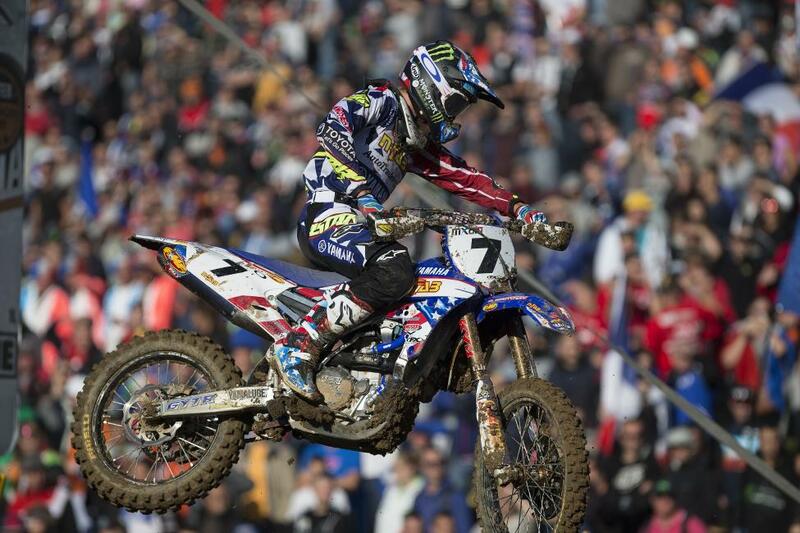 He kept the gap at about 1.5 seconds on Febvre, then the Frenchman made a few mistakes and Webb was on him. He even tried for a huge block pass at the bottom of a hill, but Febvre wisely backed out, let Webb fly past him to the outside, and rolled right back underneath. From there Febvre got back on the gas and pulled away--when this dude gets into Beast Mode, he's hard to stop. Webb then had a scare with a late crash in the ruts, and when he got up Musquin was right behind him. Webb picked the pace back up and got away from his rival here in the U.S., holding on for second. But France did what they needed to do. 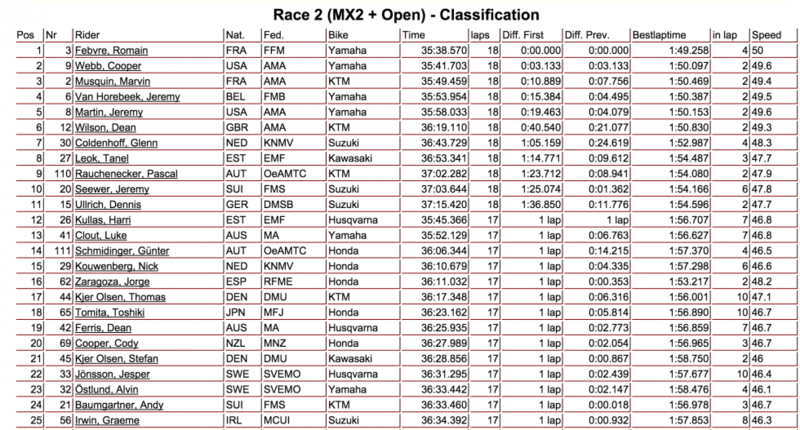 Febvre won the moto over Webb, Musquin finished third ahead of Martin's fifth. With that, they trimmed Team USA's lead from five to two, and the last moto remains. 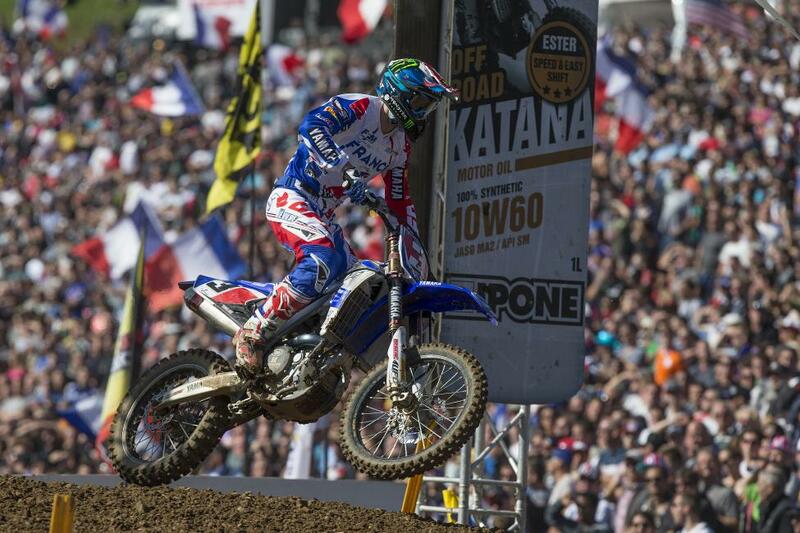 It's on the shoulders of Barcia and Webb for the U.S., and Paulin and Febvre for France. Oh my, this is going to be good. France bests Team USA in second moto, so it's a two point lead for the Americans heading into moto three This will be crazy! Thousands of miles of travel, foreign soil, fans cheering the French favorites, much was different for Justin Barcia compared to any normal race, but he made sure one thing wouldn't change: he can still pull starts. He rocketed his Autotrader.com/Toyota/N-Fab JGR Yamaha off the line and nailed the Fox Holeshot. The ageless Ben Townley shocked everyone again by running a strong second for New Zealand, but soon the French had something to cheer for when Marvin Musquin caught fire and blazed to the front on his KTM 250. Musquin was into second, around Townley, and then caught Barcia. The fans were going nuts, and when Barcia bobbled, Musquin took the lead on his little bike. Meanwhile, his teammate Gautier Paulin was fifth, and American Jeremy Martin was about eighth. Then Paulin crashed and went back to eighth. Barcia regrouped and went back after Musquin and repassed him, then Musquin came back, and then Barcia repassed him! 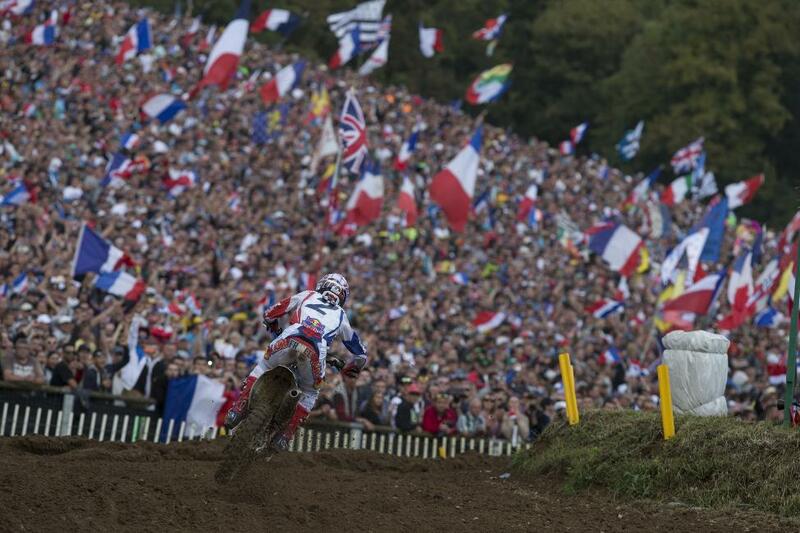 It was an amazing battle and the French fans were hanging on every part of it, until Musquin crashed hard in some ruts. From there, Barcia was able to cruise. Musquin was in trouble though, getting up slowly and losing spots to Russia's Evgeny Bobryshev and Germany's Max Nagl. Next in the order to catch him? Martin. The two battled for a bit like they had all year, but Musquin, credit to him, put his head down and got away from the American. He took fourth, Martin was fifth. Barcia scored a huge moto win up front, the first for Team USA since the final moto of the 2011 event (Ryan Villopoto). Combined with Martin's fifth and 4-7 scores for the French, and Team USA leads France 6 to 11 in the standings after moto one. "We came here to do some damage," said Barcia. "Me and Marvin were making mistakes, we had a good race. The competition is tough but we're here to brawl until the end." Next up is MX2 and Open, where the Americans will have Martin and Cooper Webb. The French will have Musquin and Romain Febvre. With several other contenders struggling through moto one, this appears to be a two-team fight for the trophy.